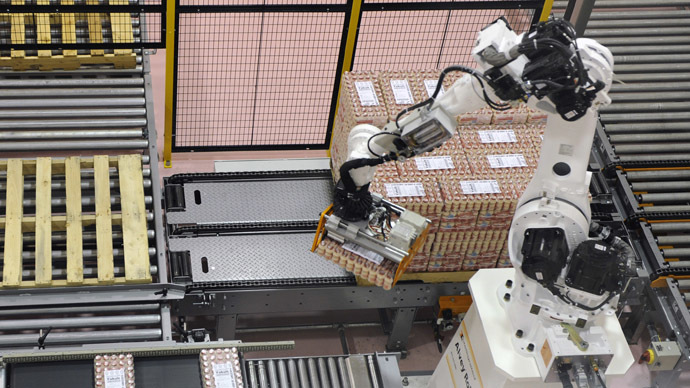 A Chinese company has begun building the first factory in the Dongguan manufacturing hub in the south of the country which will be staffed almost exclusively by robots, in a countrywide automation drive. Initially about 1,000 robots will be used at the factory of the Shenzhen Evenwin Precision Technology Co, which produces components for mobile phones. "The use of industrial robots will help the company to reduce the number of frontline workers by at least 90 percent," said Chen Xingqi, the chairman of the company’s board, China Daily reported. "When all the 1,000 industrial robots are put into operation in the coming months, we will only need to recruit fewer than 200 software technicians and management personnel." Shenzhen Evenwin Precision Technology expects that the plant's production capacity can amount to US$322 million annually. It does not, however, say how much it has invested in the project. More and more factories in the Pearl River Delta - an urban and industrial hub in South China often dubbed 'the world's workshop' - are starting to introduce robots in a bid to replace human labor. But today the region faces two problems which force it to look for new development strategies including mass automation. The first problem is a labor shortage caused by more people rejecting factory jobs. The Department of Human Resources and Social Security of the Guangdong province (where Pearl River Delta is situated) says local industry lacks about 600,000 to 800,000 workers. The second problem is that Chinese labor is becoming less cheap. China has long been the most attractive country for foreign companies because of its low-cost workforce but now China is starting to lose its advantage. Numbers aggregated by Bloomberg suggest an average Chinese factory worker earns just under US$500 per month, while in Thailand the number is under US$350, and in Cambodia it is only about US$75. Guangdong’s authorities and companies are counting on automation of the manufacturing process. The province plans to invest the equivalent of about US$154 billion in robotization of manufacturing production, according to the South China Daily. Guangzhou, the capital of Guandong, has set a goal to automate 80 percent of its manufacturing production by 2020. The International Federation of Robotics regards China as the largest market for industrial robots with 36,560 industrial robots sold to China in 2013 (20 percent of the worldwide number). By 2017 China can have more robots in industry than any other country in the world. But China’s robot-to-worker ratio is still rather low, at about 30 robots per 10,000 employees. South Korea employs the most robots, with 396 per 10,000 workers, followed by Japan with 332.